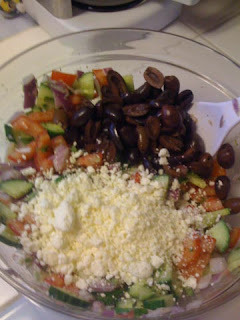 I made the most delicious Greek Salad last night … or rather, the recipe has been delicious in the past. 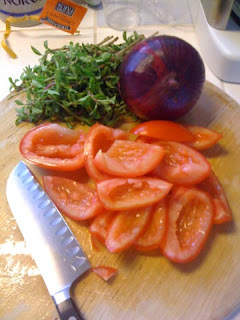 I got the recipe from InStyle magazine (of all places) and it makes a great easy cost-effective healthy salad. Directions: Add everything together. Stir well. Eat. This keeps for a few days and tastes even better on Day 2 and 3 as everything marinates together. The whole thing is a lot of food prep if you don’t have a Cuisinart (I don’t. Mom and Dad, if you’re reading this, maybe that would be a good birthday present?) But, it’s a delicious recipe. I even shopped at the local organic store yesterday and all of the produce was farm fresh and locally sourced. 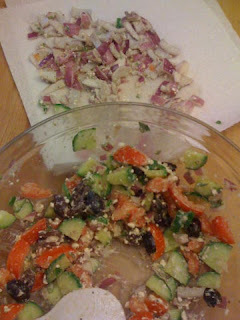 I’ve made this salad before and it was a huge hit. So, though I was crying profusely by the time the onions were chopped, I tossed them all in. For future reference, onions can be different strengths!? Who knew!?! Locally grown, fresh, organic red onions are way stronger than the onions I normally buy in the produce section of my grocery store. So, we picked out 75% of the onions and the recipe was back to balance and delicious. Thank you for sharing that. Maybe the next Greek Salad won’t be quite so painful to make. Teresa, your suggestion of a sweet onion, like the Vidalias sounds great. Ya’ll are making me hungry with your great suggestions! 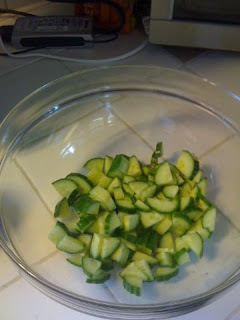 I’m saving this recipe for when our cukes and tomatoes come on this summer! Dh makes a good one too, but I’ve never known how to make one. For a sweet, mild onion, I’d recommend Vidalias. I personally like the purple ones. Dh grows a nice sweet one called “Candy”. Oooo this recipe looks so good. I can’t wait to make it! Thanks for the recipe…sounds good and I am hungry. The problem being that it is 10:45 and I need to go to bed. The more cuts you make on an onion, the greater the chance of tears. If you keep chopping on the cutting board, you are sure to end up with tears because you are releasing more of the oils and actually making the onion stronger. Cutting through the root is the highest risk of ending up with tears. I’ve been searching the internet for a good cutting video demonstration. So far they are all amateur cheesy videos. Guess I got spoiled with Chef Bruno from Culinary Institute of America. If I run across anything close, I’ll be sure to pass along. Rian, that sounds yummy! I love the idea of avocados and lemon (drooling). SpottedCow, I had NO idea there was a better way to cut onions to minimize tears. I was crying so hard and my eyes were burning – it was a mess! I’ll have to check that out. Thanks for the tip. Some onions are stronger than others. How you cut the onion also affects the strength and tears. I was recently taught by a chef how to properly cut onions different ways ~ with less tears. So far, so good. Yummm, that is one of my favorite salads. I have made that mistake with onions though, so now I only buy sweet onions. I like to sub in cilantro for the oregano, and then add in a few diced avocados and some lemon juice. I did that recently with a pasta salad…It didn’t look like too much onion…but it was a STRONG one!